The staffers at Current TV are reportedly very unhappy with Al Gore over the sale of the network to Al Jazeera. Current staffers had their first meeting with their new bosses on Monday. Gore was not there, but "the displeasure with Gore among the staff was thick enough to cut with a scimitar," The New York Post's Linda Stasi reported. She spoke to one staffer who lashed out at Gore and called him a "bullshitter." "He’s supposed to be the face of clean energy and just sold [the channel] to very big oil, the emir of Qatar! Current never even took big oil advertising — and Al Gore, that bullshittter sells to the emir?" the staff member said. "Al was always lecturing us about green. He kept his word about green all right—as in cold, hard cash!" the staffer added. Poor Al. He is simply misunderstood. When he talked about a "green agenda," he was talking about exploiting a made up environmental crisis in order to put more green in his pocket. In related news, the profit Gore made off of the sale of his network has now pushed his net worth ahead of Mitt Romney. See it pays to be green. 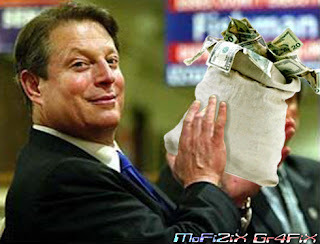 It is too bad Al Gore became a poster child for Global Warming. I always thought Clinton-Gore were Corporate Democrats. If Bill and AL could have made a buck off the Occupy Movement they would have tried it. That said there is new report out,Federal Advisory Committee Draft Climate Assessment Report Released for Public Review http://ncadac.globalchange.gov/. We should be able to as rational thoughtful human beings to examine the facts as we know them. Hmm. given that report starts with the conclusion that man-made global warming is a fact, not too many rational human beings were involved with this report. primarily due to human activities." If global warming is occurring, to conclude that it is due to changes in the Co2 level is still a unproven theory. It may sound logical but it has not been proven. and how sensitive the climate is to those emissions." Backing up a little, here, trying to say that the amount of change, if any, is not really predictable. If the cause is understood, then why can't predictions be made and verified? been, and will not be, smooth across the country or over time." Given the number and positions of the various temperature measuring stations which have changed over time as well as their proximity to bigger cities (bigger paved areas) saying the temperature rise is 1.5 degrees is a little too exact. Also note that Professor Mann's climate model weighted the value of temperature measurements, discarding those that the model said were too low gives even more reason to distrust a statement of 1.5 degree temperature rise. The report is political propaganda intended, mixed with the religion of natural is best, intended to justify new ways of taxing human activity based on energy use. If global warming is occurring and the effects are understood, it should be possible to predict the climate effects over the next decade. Climate scientists should be able to produce multiple sceneries predicting the climate and effects over the next decade, including things like sea-level rise, temperature change, and storm frequency. Predictions now, verify in ten years. If they can't or won't supply predictions, the changes are either too subtle or just random variation. In other words, put up or shut up about climate change.